Squadrons of these cosmopolitan weaver finches arc over my town-home roof and settle in a spray on my generous neighbor’s thistle-feeders, where they nibble daintily at seeds or loiter nearby for the next available spot. They are anonymous, largely ignored by people. And, as I was reminded from having recently read Providence of a Sparrow: Lessons from a Life Gone to the Birds, they are individuals, each with a unique character and personality. The author, Seattle-based electrical technician Chris Chester, discovered a newborn house sparrow while tending his garden. The naked hatchling, resembling “a testicle with a beak,” had fallen from an overhead nest. Chester and his wife successfully reared the chick, who became the pioneer of a small menagerie of rescued birds during the course of his 8 years. Chester developed an especially close relationship with “B,” who would perch on Chester’s left shoulder and sleep in the crook of his neck. One of his favorite games was Hit the Cap. Chester would place a bottle-lid over the opening in his hand, which enclosed B. B would suddenly lunge through the opening, knocking the cap into the air with his stout bill. Occasionally, B would achieve a double play, hitting the cap a second time as it descended from its first flight. He also loved to play fetch, unless he wasn’t in the mood. Chester showed a full range of emotions, from frisky to irritable. He soon grew tired of fetching the same colored cap and Chester had to seek out unusual bottled products to sustain B’s interest. 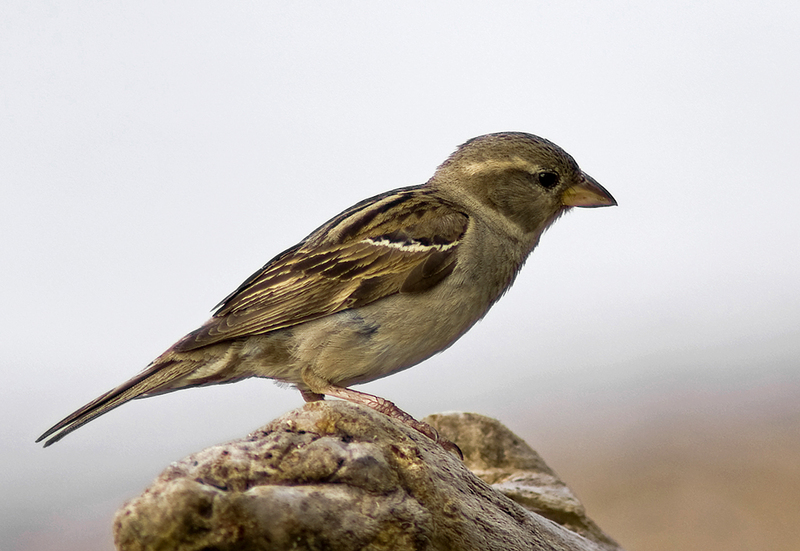 Sooner or later we must come to the uplifting—if sobering—realization that all house sparrows are unique individuals. And all warthogs, meadow voles, starlings, iguanas and goldfishes. Their seeming uniformity is only a function of our unfamiliarity. The more time we spend in their midst, the more their visages resolve into distinct personalities. Later, as I sat in the concert hall immersed in the dolorous strains of Bach’s Mass in B Minor, my thoughts returned to the little grey/brown bird. How old was she and what sort of personality did she have? Who were her friends? How felt her first flight? What adventures did she have, what flashes of fear and moments of mirth?